With the Allied Somme offensive halted in November 1916 due to the wintry weather and the muddied, shell-torn land that the Army would need to advance over, the thoughts of the commanders on both sides were turning to 1917 and not surprisingly their strategies would shape the operations for the coming Spring. For the Allied forces on the Western Front, French Commander in Chief General Nivelle devised his great 1917 offensive which called for a major French attack at the Chemin des Dames on the Aisne supported by a separate British operation further north at Arras. To assist with the offensive General Rawlinson (Fourth Army) and Gough (Fifth Army) tasked their Corps commanders on the Somme to plan for a series of attacks when the weather improved to keep the enemy under strain. For I Anzac Corps this would involve pressing the Germans ahead of them in the Bapaume region from Flers and Gueudecourt where they had spent the winter. However these plans had to be modified when on 24th February 1917 it was clear that the Germans were making a strategic withdrawal away from their front-line positions to a much more heavily fortified position to the rear known as the Hindenburg Line. The fighting on the Somme of the previous year had a devastating impact on both sides, but the German High Command knew that their position was vulnerable once the expected Spring offensive came so withdrawing to a stronger position and straightening the line meant that they could better man the defence of the French and Belgium territory they held with the same number of divisions. 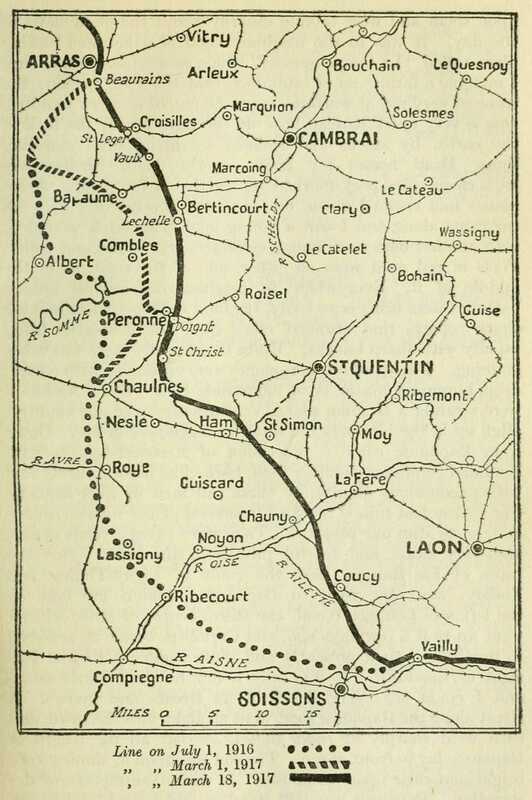 The new 100 mile line from Arras in the north to Soissons in the south being constructed in quiet surroundings and chosen for their defensive qualities would offer stronger and more comfortable shelter for the German troops in deep concrete shelters, protected by deep belts of wire entanglements. The Germans at this stage recognised that their best chance of victory on land had probably gone, but by withstanding the coming onslaught would give their naval forces through their submarine fleet, time to create a blockade of Britain causing hardship, shortage of food and eventual inability of Britain to wage further war and seek peace terms from a German position of strength. The withdrawal would also disrupt the Allied planning, therefore buying more time for building the defence and for their submarines. This period also saw a change in the fighting conditions for the Australian infantry. The cold and frosty weather in January and February brought a welcome respite from the atrocious muddy conditions that the men had to endure in the previous months. Moreover once it was clear that German Army was in retreat, a period of cautious pursuit followed involving open country warfare and the use of new enveloping tactics as the advancing troops had to clear the stubborn German rear-guard whether in machine-gun positions and platoon sized pockets or manning the chain of outpost villages that lay before the Hindenburg Line. To the Australian troops advancing the sight ahead of comparatively green valleys with buildings and trees would have been a welcome lift after the months of the grey and mud. The beginning of February saw the start of operations on the I Anzac Corps front when on the 1st February the 15th Battalion of the AIF 4th Division moving swiftly following a short barrage took the enemy by surprise and captured Cloudy Trench, a German salient north-east of Gueudecourt. However an insufficient defensive barrage resulted in a successful German counter-attack which forced the attackers back with a loss of 144 officers and men, of whom 42 were missing. Three days later the 13th Battalion was tasked with attacking Stormy Trench again, and in order to meet the chief danger of the German counter-attack 12,000 bombs were carried forward to the ‘jumping-off’ position, plus 1,000 rifle grenades to combat the greater range of the enemy ‘egg’ bombs. Learning from the earlier experience the field artillery was also to double its expenditure of shells. The counter attack came and desperate bombing fights ensued, followed by a swift, heavy and accurate German barrage on the supporting and bomb-carrying troops. The success of the attack on Stormy Trench was largely due to the leadership of Capt. HW Murray (photograph left, the most decorated Australian serviceman during WW1) for which he was awarded the Victoria Cross, though the operation had cost the Australians about 350 casualties including 100 missing, against the German losses of 250. By mid-February and as the I Anzac Corps transferred from the British Fourth to the Fifth Army, the small wearing down operations on the Somme were in full swing, including attacks and raids by the AIF 1st Division against Bayonet Trench and The Maze near Flers. On the 24th February 1917 reports came in from British V Corps that the Germans had abandoned their forward trenches. I Anzac Corps along with British II Corps was ordered that night to probe and from their discoveries and prisoners taken it became apparent that the Germans had made a massive change in their strategic plans and what was being observed was the voluntary abandonment by the Germans of their great salient between Arras and Aisne. The depth of the withdrawal to the Hindenburg Line would vary between twelve miles near Bapaume to nearly thirty near Roye. In front of the line a 15 kilometre belt was laid bare of houses and trees for shelter, and the roads, railways, bridges and wells all rendered useless. By the morning of the 28th February the villages of Thilloy, Ligny-Thilloy and Le Barque were within the AIF 1st Division’s line, which now lay in comparatively green country and a distance of some 500 – 800 yards from the German main position, Till Trench. On the right the 15th Brigade of the AIF 5th Division had cleared the enemy from Barley Trench to the German withdrawal pivot point at Le Transloy. To the west the AIF 2nd Division’s 7th Brigade made seven attacks to Malt Trench but all were bombed back with heavy loss on both sides. Fifth Army commanding officer General Gough visited the area and seeing the importance of Malt Trench gave the order for the bombardment of the German wire to begin at once and on the 2nd March three battalions of the 7th Brigade, with the 5th Brigade supporting on the right, attacked. Despite enemy bombing attacks, artillery and counter-attacks the AIF 2nd Division had established itself on the Loupart bastion and in position to create a ‘jumping off’ line for Gough’s intended assault on the next main German R.I. Line. The AIF 1st Division to the east had been digging in when came a series of counter-attacks, with the Germans penetrating behind the Australian lines. Both sides had men killed and captured, though the losses to the German attackers had been greater. On the 5th March heavy plumes of smoke rose from the town of Bapaume indicating that the Germans would be retreating further, while British airmen could see a greatly increased amount of train movement eastwards. By the 12th March patrols from the 5th and 6th Brigades reported that German front line R1, which had recently been heavily bombarded, was empty in expectation of an attack, though the 8th Brigade to the right was meeting with resistance. The 5th and 6th Brigades were now operating in almost entirely green countryside, raising the spirits of the men, as they moved to within 300 yards of the RII line. On the 17th March 1917, Bapaume (photograph right), the objective for the great 1916 Somme offensive, was entered. As the Allies followed the Germans rear-guards, bitterness grew not just amongst the French but also in world opinion against the excesses of the German military in destroying everything in its wake for little military advantage. For the infantry they had to be aware of booby-traps set in doorways, dugouts, and under boards, and in some cases such as the Bapaume Town Hall time delayed mines. The following day the 6th (Gellibrand) and 15th (Elliott) Brigades were selected as the force to drive forward, supported by mounted troops from the 13th Light Horse and a battery of field artillery. The columns would be advancing without the main body of troops behind them, therefore incurring increased risk as they approached the Hindenburg Line. In this new phase of open warfare the infantry progressed cautiously, uncomfortable crossing open countryside despite there being only few of the enemy around, and weighed down by their heavy packs. On the 20th March Gellibrand working on his own initiative attempted to take the village of Noreuil. The 21st and 23rd Battalions met with heavy resistance from machine guns in the surrounding villages supported by artillery. The first that Divisional HQ knew about it was when Gellibrand sent messages, including falling back. To Generals Birdwood and Smythe the unexpected news of this engagement and the casualties suffered – which was eventually found to be more than twice as Gellibrand at first believed, totalling 13 Officers and 318 other ranks – came as a shock. As a result Gellibrand never regained with Birdwood the high regard and confidence which he previously had. With Elliott progressing faster than the rest of the front, the Germans – including a company of storm-troops – attempted to retake the village of Beaumetz but were beaten back by his 15th Brigade. This attack was evidence of Ludendorff and Hindenburg’s plan to hit back hard at the following troops, and justified Field Marshal Haig’s precautionary and cautious approach of not over exposing his advancing armies. I Anzac Corps had now reached the chain of villages that lay just before the Hindenburg Line. One such village was Lagnicourt and on the 26th March the 26th and 27th Battalions of the 7th Brigade were tasked with attacking the village, supported by the 15th Brigade on the right flank. The village was the first of this line to be taken but at a cost of 377 casualties. The Germans did not try to retake the village but heavily shelled the buildings and it was from a shell bursting in a sunken road that Capt. PH Cherry (photograph above) of the 26th Battalion, who through his good work leading from the front earlier in the day had been awarded the Victoria Cross, was killed. After the capture of Lagnicourt the AIF 2nd Division was relieved by the 4th which came into the line fresh from a month’s rest and training. It was decided that the Fifth Army and the right of the Third should attack on the same day the string of villages that lay as outposts before the Hindenburg Line. The taking of Noreuil would fall to I Anzac Corps. The next village in the Australian sector, Lagnicourt, had already been taken, leaving the right hand column tasked with seizing Louverval and Doignies. The villages of Boursies, Demicourt and Hermies also lay in this chain but they were considered less of an objective as no serious attempt against the Hindenburg Line would be made behind them. The envelopment attack on Noreuil was undertaken by the 50th and 51st Battalions of the 13th Brigade, with the 50th attacking from the captured village of Lagnicourt. The operations were still in open country, clear of all fortifications except the wire entanglements and trenches bent around the outskirts of the villages and a sprinkling of sentry posts, frequently in the sunken roads which were common in these parts of France. The sunken roads would not only provide cover but by scooping into the sides could provide shelter, and in some locations such as at Noreuil the Germans were able to tunnel deep dugouts in the road-banks. At 5.15am on the 2nd April the supporting barrage started to fall on the enemy positions and the two battalions advanced together. The 51st met with machine-gun fire from the left, right and the sunken Noreuil-Longatte road ahead, causing eighty men to fall before the position was taken and prisoners captured. The 50th were having difficulties as the suppressing barrage was too thin to be effective, and suffering enfilade fire from pockets of Germans behind the steep bank. During the fighting Pte J Jensen (photograph right) rushed a position and bluffed more than forty Germans to surrender, and was awarded the Victoria Cross. With the Lewis gunners firing from the hip, the battalion advanced. However by 8.45 the position was becoming precarious as the Germans were holding in strength in the gullies and Australian casualties were mounting as the Germans started to attack with bombing parties. Fighting continued all day, but by dawn when the 51st were preparing to rush the German positions they had found that they had retired during the night. The attack by the British on the villages to the north had met with similar difficulties, but they too had succeeded. The two brigades of the British 7th Division suffered about 400 casualties, but the loss to the 13th Brigade exceeded 600, with the 50th Battalion losing 360 of which about 100 were killed and 60 taken prisoner. Further south the 55th Battalion captured Doignies with limited casualties, whereas the attack on Louverval by the 56th was more problematic and resulted in 484 casualties for the 14th Brigade, many as a result of subsequent shelling of Doignies, Louverval and Beaumetz. Only twelve prisoners were taken in this area. Thus on the left half of the Fifth Army’s front the last obstacle to Gough’s projected diversion against the Hindenburg Line had been removed, and all divisions began pushing their posts closer to the main defences which scarred the open country a mile or so ahead of them. On 6th April the AIF 1st Division relieved the 5th and a portion of the 4th in preparation for the oncoming Arras offensive. The preliminary movement against the three remaining villages in the I Anzac Corps sector began with a movement to secure the high ground above Boursies. Two companies of the 12th and two from the 10th Battalions attacked at 3am and successfully created a small salient, though subject to bombing counter-attacks, and at a cost of 90 casualties. The main attack on the village of Boursies began at 4.45am and took place on the same day as the start of the Arras offensive, this action acting as a minor feint to the main battle taking place further north. The 10th and the 12th Battalions took the village at a cost of 341 casualties. The attack by the AIF 1st Division also included a successful attack on the village of Hermies by the 1st Brigade. Except for a few of the garrison, practically all of the Germans were either killed or taken prisoner, but at a loss of 253 officers and men for the 2nd and 3rd Battalions, of which the high proportion of 1 in 3 were killed. The 1st Battalion moved on Demicourt and occupied the village, sustaining 55 casualties. By successive local advances made at night without serious opposition, the I Anzac Corps line was over the next few nights pushed forward to within less than a mile of the Hindenburg defences. Despite some pieces of local intelligence in the days leading up to the German withdrawal, when it came it caught the British High Command by surprise. Unsure of its motive and wary of being set a trap for a strong counter-attack it led to the cautious Field Marshal Haig to pursue his foe in a methodical fashion. Furthermore the German Divisions tasked with the rear-guard action fought a skilful and purposeful retreat. Its scorched earth policy of destruction did not endear it to the international community, but this action along with its change of strategy to target shipping of all nationalities in order to win, was a product of total war seen at this time. The withdrawal to the stronger and shorter Hindenburg Line defensive system did mean that the German Army was far better enabled to withstand the Allied offensive when it duly arrived, and though not knowing it at the time, bought the German Army time through 1917 until the ‘Russian Revolution dividend’ that gave it the numerical advantage to mount its spring offensive the following year. Through the advancement of the Allied front-line, the British First, Third and Fifth Armies were now in position to launch their part in the Nivelle plan, the Arras Offensive.